Prevention magazine asked us to elaborate on hidden sugars in so called “healthy” breakfast options. Breakfast is typically a grab and go meal on most weekday mornings. A few quick options include shake/smoothie, cereal, oatmeal, toast, bagels, and egg scrambles. These options seem light and harmless but they can be loaded with sugar. The best options for breakfast are those that are low in sugar, high in fiber and of course balanced with healthy fats and quality protein. Preparing your breakfast at home is the best way to control the amount of sugar you consume. It is best to keep your added sugar intake at or below 10 grams per day. Added sugar examples include, honey, syrup, granulated sugar, jam, jelly, and of course the sugar that is in yogurt, candy, breads, cookies, pastries, etc. Natural sugars from fruits and vegetables do not count towards these 10 grams per day. Aim to consume 2-3 servings of high fiber dark fruits like berries per day, even though fruit is natural sugar you can still go overboard. 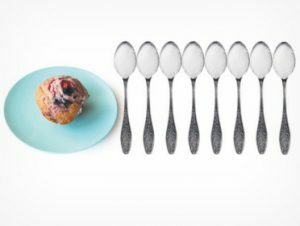 Now that we have established a daily limit of 10 grams or less of added sugar lets look at the sugar content of “grab and go” options from coffee shops, fast food, restaurants, etc. These are supposed to be healthy options, but clearly over the limit. Hopefully you are now convinced to eat breakfast at home if you are trying to reach your health and weight management goals. Beware, even making things at home can wreck havoc on your sugar consumption if you are not careful. Here are some sugar busting strategies that will keep your consumption within optimal range. Do not use juice in your smoothies or shakes, instead use unsweetened almond or coconut milk or even water as your liquid. You can save over 30 grams of sugar with this substitution. Do not use syrup. If there were one food that I would advise for you to remove from your diet it would be syrup. It is the most potent from of sugar that will send your insulin on a roller coaster ride resulting in metabolic disruption. Instead use unsweetened applesauce or pumpkin, this can save 35 grams or more of sugar. Keep your coffee simple. Get used to drinking coffee black or with cream only. Even the sugar free options can cause a blood sugar imbalance. Getting use to unsweet coffee can save at least 10 grams of sugar. Do not eat prepackaged oatmeal packets or flavored cereal. They are loaded with processed sugars; instead sweeten your own with stevia, natural almond butter, fresh fruit, or a small amount of honey. You should always have a side of protein with oatmeal or cereal whether it is a tablespoon of protein powder added in, or an egg on the side, keep your meals balanced. Even if we know how to avoid sugar our body’s cravings, it can be a test of our will power. Follow these strategies to break your sugar addiction and eliminate cravings. Drink half your body weight in ounces of alkaline Hydroxide rich water (Aqua-OH!). This specific type of water reduces acid that is produced from consuming sugar, restoring the body’s natural pH balance. The OH-(hydroxide) in the AQUA-OH! searches out and combines with H+ (hydrogen proton which causes the acidity) forming water. The body then either uses the water in metabolism or urinates it out. This eliminates the acid (caused in this case by excess sugar) and drastically reduces the inflammation caused by the excess acid. Eat fiber rich foods. Foods that contain fiber like fruits, vegetables and unprocessed grains will keep you feeling more full while promoting steady insulin levels, therefore reducing cravings for sweets. Do not cut out fats. If you crave sugar replace the satiety with healthy fats. Fats like avocado, nuts, seeds, nut butters, oils, etc. will keep you satisfied without hindering fat loss. Dietary fat does not make you gain weight as much as the insulin fluctuations from consuming too much sugar. Always have protein. Protein is another macronutrient that will keep you satisfied and nourished. Consuming a shake without a scoop of protein or toast without a side of eggs is a recipe for disaster when it comes to blood sugars and fat loss. When blood sugars rise the body is unable to burn fat efficiently. Your body needs healthy fat, protein and complex carbohydrates for optimal metabolic function. Start reading labels, tracking your food intake and avoid grabbing breakfast out and about. Mastering this one meal per day can be the start to future healthy changes to your best self.